CLA 1300 mg / 90 Softgels - Nature's Way®. Supplement providing a minimum of 78-80% CLA derived from safflower seed oil. 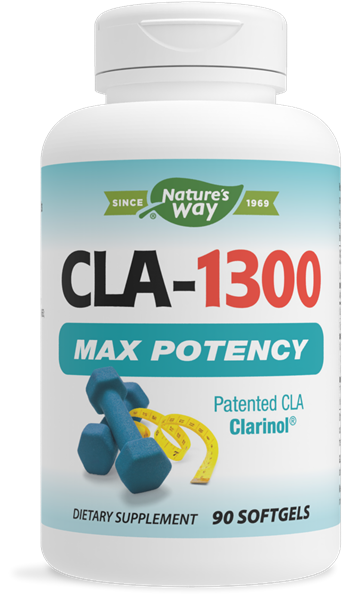 CLA-1300 contains patented Clarinol® providing 78-80% conjugated linoleic acid (CLA) derived from safflower seed oil. Take 1 softgel three times daily, preferably with food. Nutritional uses of Clarinol® are licensed to Stepan Lipid Nutrition under U.S. patents 6,271,404; 5,814,663; 5,760,082; 6,184,009; 6,127,562 and 6,340,491. Clarinol® is a trademark of Stepan Lipid Nutrition. Not recommended for pregnant or nursing women. If you have diabetes or if you are taking any medications, consult a healthcare professional before use.